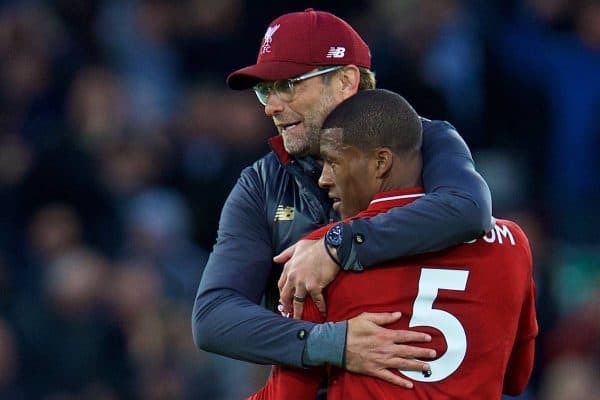 Touted with a move away from Liverpool in the summer, Gini Wijnaldum has become one of the club’s most important players, and crucial to their title hopes. It was an unorthodox way to attract attention. A bit of vomiting, a touch of diarrhoea and a delightful lobbed goal later, Gini Wijnaldum came in for unusual praise from the wider world. Going from sickbed to the scoresheet constituted a fine narrative. The way a grafter supplied a craftsman’s finish against Bournemouth was uncharacteristically eye-catching. 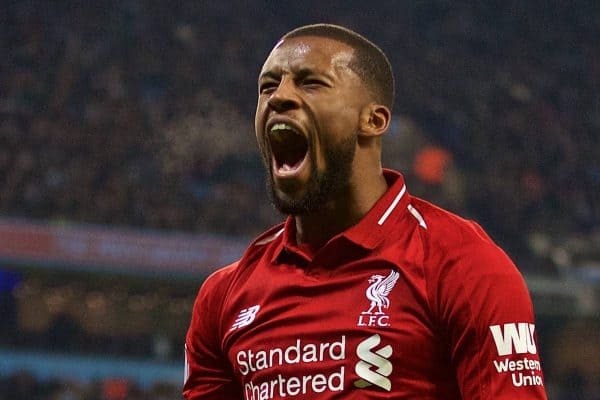 His is not a surname that lends itself to headlines, and his style of play means that Gini is rarely extended into Gini-us, but, briefly, the limelight lingered on Liverpool’s most indispensable midfielder. If few fly under the radar at clubs of Liverpool’s size, Wijnaldum may be that exception. His £25 million fee has been dwarfed since others arrived. He is no longer the newcomer under scrutiny. He scores fewer goals than he did at Newcastle. He plays in a department of the side that observers can bypass in between focusing on a bolstered defence and a prolific front three. 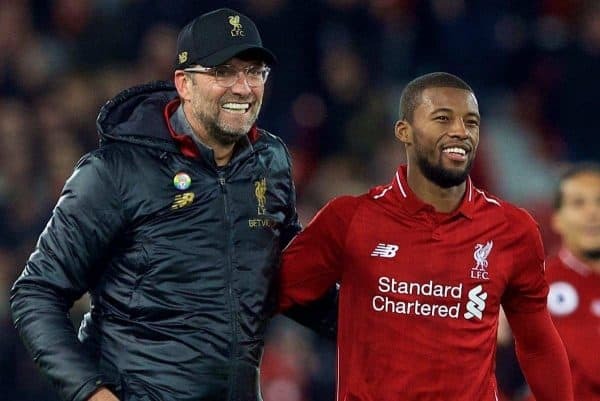 If some of Liverpool’s iconic midfielders—think Graeme Souness, think Steven Gerrard—have had a magnetic on-field charisma, Wijnaldum is more understated. With his ever-ready smile—though more steel is shown behind closed doors—he has the feel of the forgettable nice guy. Instead, he has quietly underpinned Liverpool’s challenge, his own rise reflected when his team-mates voted him the fourth in line to captain the side. Rewind to the summer and the casual observers could be forgiven for believing rumours he would be sold. Superficially, it made sense: Naby Keita and Fabinho were coming in for sizeable fees, and Nabil Fekir may have been a third expensive addition. Jordan Henderson and James Milner were captain and vice-captain and the latter had just mustered more assists in a season than anyone else in Champions League history. That early adoptee of gegenpressing, Adam Lallana, was due to be fully fit again. Jurgen Klopp did not subscribe to that theory. Instead, the opposite has happened. Rather than being surplus to requirements, Wijnaldum has become the heartbeat of the side. He is Liverpool’s most-used midfielder in the Premier League, with his 1,851 minutes in effect over 600 more than anyone else, given Milner’s stints at full-back, and the Champions League, sitting out only 24 minutes of their campaign. He has become the man for all occasions: outstanding against Bournemouth, but delivering his true tour de force and, so far, season-defining display in the 5-1 thrashing of Arsenal. He helped overpower Man United. He scored at Tottenham. He is the constant, the common denominator. Sometimes it is Wijnaldum plus one in the centre of the pitch, sometimes Wijnaldum plus two. “He can play in all three positions in midfield,” Klopp noted in December. He can be the most attacking of a three or the No. 8 who holds back to allow another to go forward. He can play on the left, the right or in the centre. No one else, despite Milner’s extraordinary versatility, is as trusted to occupy every midfield role. 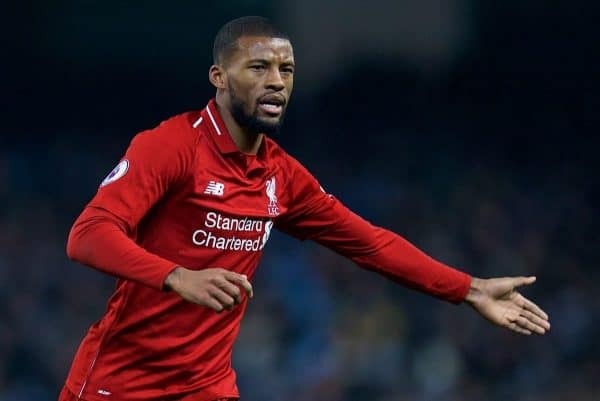 If, in the absence of Henderson and Emre Can, Wijnaldum seemed a strange choice to operate as the No. 6 in the Champions League tie at Man City last season, he came of age as a holding player in the second half. Now it feels normal when he assumes a deeper role. His capacity to follow instructions, however improbable, was such that, to his surprise, he slotted in as a centre-back at Brighton in 2017. Wijnaldum may not be Liverpool’s most talented midfielder, but he is the most trusted. He is also the most adaptable. “He combines a lot of things you need,” said Klopp a few weeks ago. The classic Klopp midfielder is not a specialist, a pure playmaker, a tackler, a holder or a scorer, but an all-rounder. He did on Saturday, starting as more of a holding player and then, after a tactical tweak, beginning to use his running power and reading of the game to burst into the box. He combines the physical with the technical. Wijnaldum has the highest pass completion at Anfield, and the fourth best in the division, at 91.9 percent. Tellingly, if surprisingly, only Sadio Mane is fouled more often. And yet his efforts cannot be assessed in isolation. Perhaps the real reason, still more than his fitness, his adaptability or his capacity to keep the ball, why he features so often is that he has become Liverpool’s great facilitator. He permits Klopp to play 4-3-3 or 4-2-3-1. 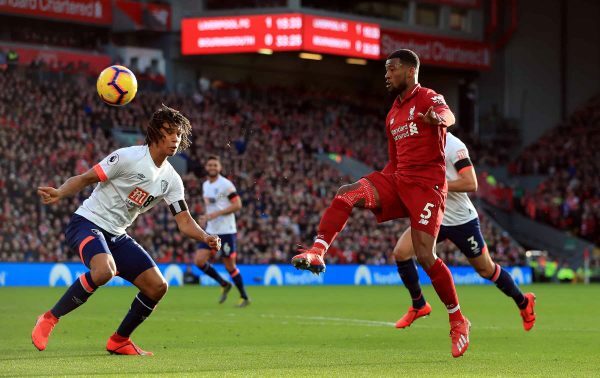 He makes others play better: if Keita’s performance against Bournemouth was among his most encouraging at Anfield, it came in harness with Wijnaldum; if Fabinho improved rapidly after an awkward start, it was when paired with Wijnaldum. When Henderson was first used as the anchorman, he had Wijnaldum as his sidekick. He has helped others realise their potential. As Liverpool pursue a first league title in 29 years, as Virgil van Dijk should be a contender in awards season, Wijnaldum merits a prize of his own. He is Liverpool’s best-supporting actor.